Speaking of concerts… I always get the question from prospective students, “What do you guys do for fun here?” And I get it. The idea of a college in a small town in Vermont does not sound like the most “happening” place in the world and initially looking at colleges, I was worried about the same thing. I had friends who had already committed to schools in the city because there would be “so much to do all the time.” However, I distinctly remember a current student telling me during my preview days, “Yeah, the great thing about Middlebury is that either the school brings cool things here or the students make cool things happen.” And the thing is… she was totally right. 3. The school is always in support of these student initiatives. If you have a speaker, band, performing artist, comedian (you name it) that you want to bring to campus, with a little bit of organization, it isn’t that difficult to make it happen. The beginning of this semester totally showcased this point. 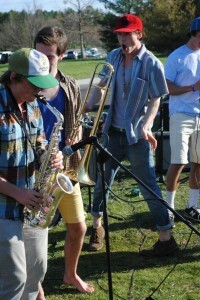 In one weekend, we had WRMC (student radio station on campus)’s spring music festival Sepomana, which brought rocking indie bands like Baths, Delicate Steve, and Rubblebucket. The next night, a benefit concert was thrown with Middlebury’s very own Alpen Glow opening for Anya Marina while at the Hepburn Zoo, an improv group brought PULSE, a 10-Person percussion group to perform. 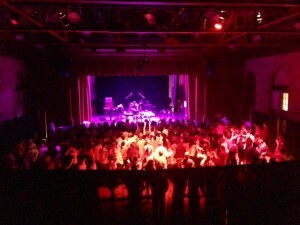 After this, one house hosted a 1950’s high school dance with a student band playing live. Whoo. And best thing about it, rather than some concert in a city, I get to be dancing with all my friends throughout. Alpenglow In Studio from WRMC 91.1FM on Vimeo. This entry was posted in Student Life, Vermont on May 1, 2013 by Christopher de la Cruz. Rowdy Roast: Spring Is Here! Spring Is Here! So, after 5 straight days of sunshine, it is official. Spring is here. Now, I know… this should have been the case 2 months ago, but you never want to get your hopes up when a sunny day comes up in the middle of April. The next day could easily be rainy (maybe even snowy…) but! now. Without a doubt. It is here. And boy, is the campus celebrating. Last Saturday, 4 different houses all along Rt. 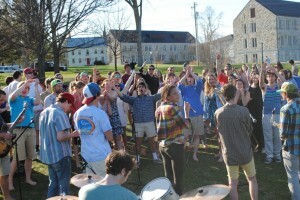 30 (mine included) joined together to throw a huge roast and outdoor concert in the middle of the day. That morning, I had gone off campus to pick up a friend from Burlington and got back on campus around 3 PM. I knew that by this point, the concert should be going on, but I did not expect to see about 300 people out on the green playing lawn games and dancing to a set of 5 different student bands. At that point, the pig (which came from a farm just around the corner!) had already been eaten, but the music went on until 6 PM. I think something I have really enjoyed about my last 4 years here is the amount of enthusiasm people have for the weather. In the fall, people fall in LOVE with the foliage – in the winter, people are screaming as they run out into the snow, and just when it starts to warm up, frisbees are out and people are laying out in the sun (and don’t get me started about summers in Vermont). That excitement is contagious, it gets 300 people out on a lawn throwing frisbees, kicking hacky sacks, and dancing to some pretty rockin’ student bands. This entry was posted in Uncategorized on May 1, 2013 by Christopher de la Cruz. 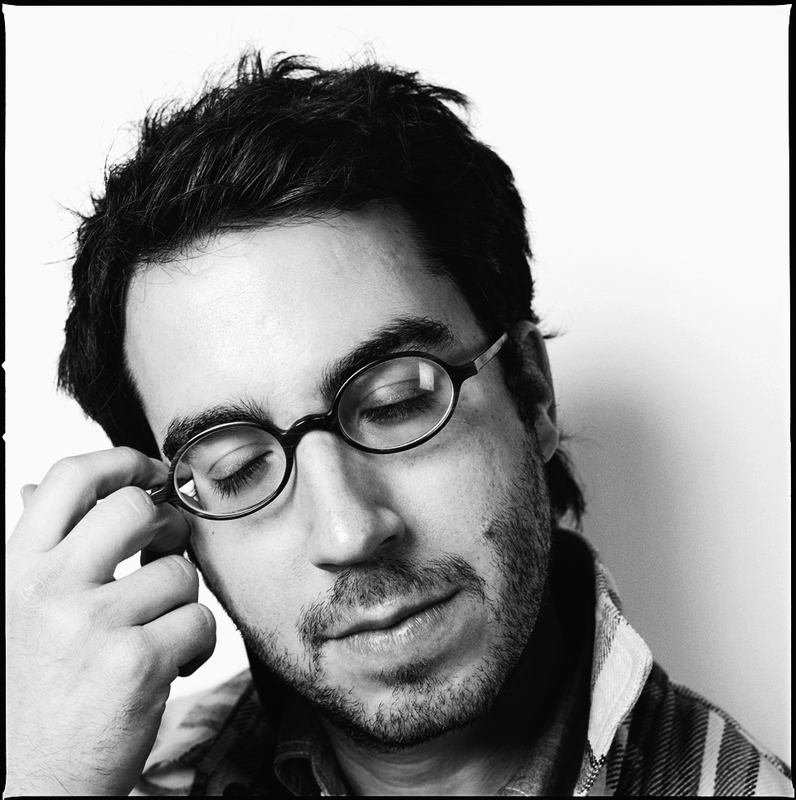 I am not sure if you’ve seen the big news on the front page, but author Jonathan Safran Foer is going to speak at the commencement address of the class of 2013! Which is my graduation! Now, the fact that such a renowned author (Everything is Illuminated, Extremely Loud and Incredibly Close, Eating Animals) is already pretty huge. Ever since being introduced to David Foster Wallace’s famous commencement address, This Is Water, given to the Kenyon College class of 2005, I have always dreamed of having a favorite author deliver the parting words of my college. But this is not just any favorite author. This is the author of my year’s Common Reading selection. The summer before you come to Middlebury, you receive a welcome packet that includes a map, your first year course selection, some promotional materials, and a book. This book is your Common Reading and the school ask that you read it before arriving on campus to then engage in intimate group discussions led by faculty and staff during the week of Orientation. The book I received my year was Everything Is Illuminated. I can remember this book being what completely reaffirmed my decision to enroll at Middlebury. It was the first time reading the book (I had only seen the movie with Elijah Wood…) and I remember being astonished that the school would select such a complex and emotion-filled book as the introduction to the college. When we arrived on campus, I was so excited to have our Common Reading discussion – I had fallen in love with the author’s prose and his style of communicating the narrative. I could not wait to begin connecting with other students through literature. After this experience, I held on to the dream that Jonathan Safran Foer might be the one to speak at our graduation – that the voice that welcomed us to this four-year adventure might be the one that would send us off. When the news came out that he would indeed be that voice, I jumped in joy the way I did when I found out I got into Middlebury. What a beautiful thing to see it all come full-circle. This entry was posted in Admissions, Speakers, Student Life on March 22, 2013 by Christopher de la Cruz. I had not seen her since we both left for abroad (she went to China and I went to Chile) in the winter. I knew our reunion would be the highlight of my day except the fact that every time I would mention it to someone, they would warn me of the Severe Thunderstorms and Tornado Watch approaching the Vermont area. But the sky looked pretty clear to me when I left at 2:30 PM… until I started seeing the traffic lights swinging due to the high winds on the way out of Middlebury. By the time I reached my friend at the Burlington International Airport, the winds had street signs completely blown over. As happy as we were to see one another, our hugs were quick as we realized conditions were only worsening. The rain began as we were pulling out and by mid-way it poured to the point where we could barely see through the window. As excited as we were to come back to Middlebury for our senior year, after being abroad, my friend and I were both concerned about the readjustment (reconnecting with old friends, adapting to the workload, making this place home again, etc.). Jokingly, with still some worry in our voices, we kept making reference to how this “Severe Thunderstorm” may be a bad omen for the year. By the end of the drive, the rain began to settle. After we moved her things into the house (a house of 30 people, so more like a dorm), we sat in our common room to catch up with the house members we hadn’t seen in months, some an entire year. Already, it was so nice to talk to these people, to see how some things really hadn’t changed. Then, all of a sudden, one of the house members rushed into the common room and started screaming, “Come outside! Come outside!” Without question we followed along behind him. He took us behind the house, facing toward the Green Mountains. My friend and I couldn’t see anything and thought he was just about crazy, but then, behind the clouds, we made out a huge rainbow. If we were still looking for omens, I think this was the one to accept. This entry was posted in Uncategorized on September 28, 2012 by Christopher de la Cruz.